Over the years, the word "condominium" has become the generally accepted term to describe a unit or suite in a low- or high-rise residential building. "Condo" is often used synonymously with "apartment", and for many, a home high up in the sky often comes to mind. What many people may not realize however, is that "condominium" or the more technical term "condominium corporation", simply describes a legal form of ownership - individual ownership of a unit in a multi-unit building or complex, along with proportionate shared ownership of common areas and amenities. As such, condos come in many shapes, sizes and forms: from residential high-rise units to mid-rise lofts; townhomes and semis to detached multi-storey homes and bungalows. Even commercial units or private driveways can be condominiums. Interesting, huh? Just a little something to think about next time you hear the word "condo"! Project details for what might be the most highly anticipated project of the year, One Bloor, were finally unveiled this morning! The flagship condominium for Great Gulf Homes, this sculptural 65-storey tower will be located on the southeast corner of Yonge and Bloor, changing the face of the iconic Bloor-Yorkville neighbourhood. Highlights include spa-like amenities over three levels of resort-inspired indoor / outdoor space, not one but two swimming pools and three different levels of luxurious features and finishes: Silver, Gold and Platinum. Major differences from the original project include fewer floors and a purely residential/retail building scheme (previously included a hotel). Suites are being offered first to purchasers of the original One Bloor project, and will be rolled out to real estate brokerages and the public over the next few weeks. For full project details, please visit One Bloor here. The LiveHigh Team recently visited the Sales Centre for Miracle At Yonge by the Pemberton Group, to be located west of Yonge St. and north of Bantry Ave. in Richmond HIll. If the proposed TTC subway extension in Richmond Hill becomes a reality, a condominium in this area could prove to be an interesting investment. As of our time of visit, a limited-time promotion for $10,000 off all listed prices was available to purchasers. This translates into starting prices as low as $361/sf, and just in case you're wondering, that includes a parking spot, locker and perhaps even more atypically, window coverings! Interested? Click here to view updated pricing and other information from our visit. The LiveHigh Team attended the Exclusive Broker Event for Eleven Residences this past Monday. Located at 11 St. Joseph St, just west of Yonge, this building is certainly convenient, located just steps from Wellesley station with easy access to many coffee shops, restaurants and retail stores along Yonge St. Approximately four years old and formerly a rental building, units at Eleven Residences have or will be refinished with engineered hardwood flooring, stone kitchen counters, stainless steel appliances, new bathroom vanities and new lighting. Existing tenants had an opportunity to purchase the suites at special tenant rates until March 9. The Public Grand Opening for Eleven Residences happens this Saturday, March 27th. For updated pricing and other information, please visit the Eleven Residences page here. As the rain continued to fall on a dreary, cold and windy Monday night in Erin Mills, many camped out in tents and cars along Destination Drive, braving the weather, exchanging friendly banter and...well, waiting. In fact, many had already been waiting patiently for over a week - and for good reason. On this makeshift campsite that was short only a bonfire, these individuals were lined up and eagerly awaiting their opportunity to purchase a brand new home in the FirstHome™ "Destination Drive" community by The Daniels Corporation. With prices starting at only $139,900, these already-built condominium suites and townhomes make home ownership attainable for those who might otherwise find buying a home out-of-reach in an ever-appreciating real estate market. These 130 affordable suites range in size from Studio to 3-BR units with move-in dates as early as 30-90 days, offering first-time homebuyers a phenomenal opportunity to own a new home in an established community. On-site, the growing crowd is impressively organized, co-operative and self-regulating. With several volunteers having taken the liberty of appointing themselves as foremen of sorts, a clever number and roll-call system has been developed to ensure fairness for the hundreds waiting, and the potential for chaos seems well under control. Prospective buyers will have an opportunity to preview the completed homes prior to purchase beginning tomorrow (March 24th), with sales slated to begin this Saturday morning (March 27th) at 8 AM on a first-come, first-served basis. This is Daniels' seventh FirstHome™ community and the second phase of an incredibly successful development. For your chance to become one of the lucky purchasers at FirstHome™ "Destination Drive", we'd recommend that you pack a thermos of hot cocoa and head over ASAP to secure your spot in line! Destination Dr. is conveniently located just north-west of Winston Churchill Blvd. and Eglinton Ave. W., with easy access to Hwys 403 and 407, alongside many neighbourhood amenities. Tucked away in Toronto's Fashion District, this quiet strip of Wellington St. between Spadina and Portland is just steps from the hustle and bustle of trendy King West restaurants, lounges and bars, while continuing to maintain its 18th century historical charm. Known by some as a part of the Wellington Place neighbourhood, this little area on Wellington St. W. is protected by the fact that it doesn't have any through traffic from the east side of Spadina, and becomes a one-way street west of Portland. As such, this peaceful strip offers an understated calm while providing residents with all the excitement and conveniences of downtown living. In the immediate area you'll find the Herman Miller showroom (the authority on office furniture design), Le Select (a French bistro with an outdoor patio) and Marben (a popular resto-lounge). Hip night-spot C Lounge and Flirty Girl Fitness, a women's fitness and lifestyle facility, are other area favourites. Aside from fantastic neighbourhood amenities, this part of Wellington St. also benefits from easy highway access and relative proximity to the nearby Waterfront and Financial District. If you're interested in living here and luxury and character are what you're after, then consider the Worx Lofts (also known as the Monarch Building) or Wellington Lofts. Both boutique buildings and authentic hard loft conversions, these lofts feature highly desirable original wood beams, exposed brick and high ceilings. The Worx Lofts houses units ranging from 980 to over 2,000 sq ft, while Wellington Lofts features larger units ranging from 4,000 to over 5,000 sq ft. If loft conversions aren't your cup of tea, two new projects are also available along this strip: 400 Wellington by the Sorbara Development Group, and 500 Wellington by Freed Developments. 400 Wellington is a 12-storey building with units ranging from 514 sq ft to 1,820 sq ft, while 500 Wellington is a boutique condo offering 17 luxurious loft suites from 2,500 to 6,000 sq ft. The four buildings differ vastly in suite styles and sizes offered. Prices vary by building, but you can expect to spend anywhere from $450 to upwards of $600 per sq ft. While we love the ongoing modernization of the central King West neighbourhood, it's hard not to appreciate this unassuming little strip along Wellington, which, even through modern day development has managed stay true to its roots and continues to pay homage to the rich history of the area. Nothing Like Free Pastry To Start Your Day Off Right! For us condo dwellers, there's nothing quite like the feeling of strolling down the street and grabbing a freshly brewed cup of java to start the day right. 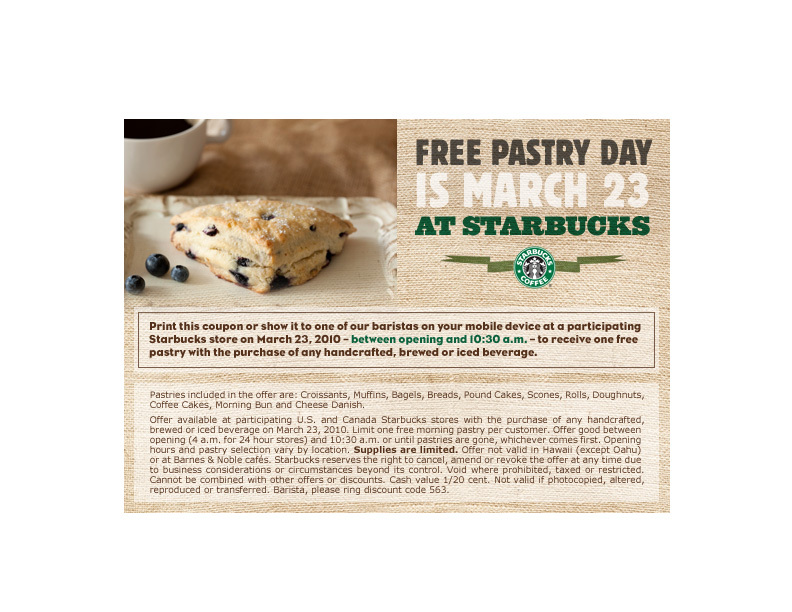 Well, our friends at Starbucks know that too, and they're offering everyone who does that on the morning of March 23rd a free pastry to make their day even brighter! All you have to do is print this out or show the coupon we've uploaded (after the jump) on a mobile device with your purchase of any handcrafted, brewed or iced beverage before 10:30 am this coming Tuesday. As promised, here's our update from the long-awaited Grand Opening of the Thompson Residences! We arrived around 3:30 PM, and a modest lineup had already formed while finishing touches were being put on the presentation centre. The sales office itself looked sophisticated and modern with its sleek black mirrored glass facade. They managed to put this up fairly quickly - a tent sat in its place just days earlier! By 4 PM, the lineup had sprawled way past the roped area. A camera crew was on-site to capture footage of the event, while friendly salespeople greeted the crowd, passing out wristbands (actually, coloured tags) and sales packages. Many buyers were with agents, while others appeared to have ventured out alone. Doors opened shortly after 4, and the sales office was buzzing with excitement. Many units were already sold (the sales board looked like a sea of red dots!) and it seemed that every salesperson on the floor was fully occupied with buyers. Peter Freed himself made an appearance at the event, which, based on our observation, was highly successful. Official pricing and other updated project information can be found here. Congratulations on another amazing project, Freed Developments! Located in the heart of King West and pegged to be the third phase of the highly successful Quad Lofts, this Cresford project seems to have been keeping under the radar as of late. However, you can expect to hear much more about Lofts 399 in the months to come, with their anticipated construction start and planned building addition! This highly anticipated luxury project is set to open its Sales Centre to the public today! The Thompson Residences by Freed Developments will be located at 621 King St W, just west of Bathurst St in the heart of central King West. Doors will open promptly at 4 PM, and buyers will be attended to on a first-come, first-served basis. An official price list has yet to be released, but we've updated the Thompson Residences condo profile with anticipated pricing, building and suite features and other project highlights. Stay tuned for our update this afternoon from the Grand Opening! If you’re tired of the winter blues and looking for a quick and inexpensive decorating pick-me-up, consider a little colour therapy. A simple coat of paint is one of the most economical and effective ways to completely change the look and feel of a room. But with so many different colours to choose from, where does one begin? The LiveHigh Team recently visited the Sales Centre for River City. River City will be located south of King St E between River St and the Don River, near the Distillery District. Also known as the West Don Lands area, this is the first phase of Toronto's new revitalized waterfront development. With the future site of the 2015 Pan Am Games Athlete's Village to be built in the area, much of the nearby construction will likely be fast-tracked. The area's 18-acre Don River Park is also expected to be ready prior to the Games. If housing demands continue to remain strong, this may just be the next "it" neighbourhood! For more details on prices and offerings, please click here to access the River City page. 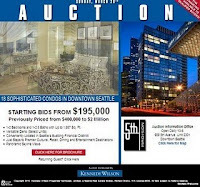 The builder of Seattle-based 5th and Madison condos - a 24-story, 126 unit project located in the city's Financial District - will be auctioning off 18 remaining units on March 28. The minimum bid starts at $195,000 for an 808 sq ft one-bedroom unit, previously priced at $399,000 or more. The highest starting bid is $995,000 for a 1,957 sq ft penthouse that was previously listed for $1,995,000. Given the "fine print" detailing the builder's assignment of an unpublished reserve price (i.e. minimum selling price) to each available unit, the auction has prompted mix reactions: Is the auction simply an advertising gimmick, or is it a true reflection of plummeting home prices, continuing foreclosures and unemployment in a downturn economy? 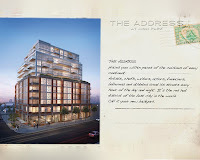 The Address At High Park - the name says it all! High Park is highly coveted for its interesting, diversified community and hip urban vibe, so we were excited to see a new development in the area. This highly anticipated project will be located north of Bloor St W, west of Dundas St W.
As noted by the builder, "people are drawn here to the neighbourhood’s creative vibe, its varied menu of eateries and foodie haunts. But most of all it is 'The Park' – High Park – that defines this community." The Sales Centre for the project held its Grand Opening recently. For more details on prices and offerings, please click here to access The Address At High Park page. 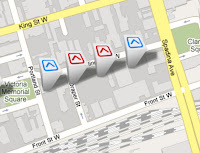 The LiveHigh Team also visited the Sales Centre for UpsideDownCondoPrices.com (Electric City). The project will be built around Dupont St and Dufferin St. Phases 1 and 2 are available for purchase. Prices are very attractive when compared with other new projects in the city, and are also pretty competitive for the area -- from as low as $312/sq ft. The 2 buildings are part of a 7-building project plan to be built over 39 acres. For more details from our visit, please see the UpsideDownCondoPrices.com profile page. We're so excited to have announced our Beta Launch last week! Did anyone happen to catch our news release? Canadian income tax deadlines are just around the corner, and just in time, the Canadian Condominium Institute (CCI) has released an information bulletin to clarify how the Home Renovation Tax Credit (HRTC) affects condominium corporations and condo owners. The document includes the legal interpretation of HRTC rules and the legal responsibilities for condo boards and property management companies. As a follow-up to our original HRTC post, condo owners, boards and management companies may find this information helpful. Based on the bulletin, the statement of eligible expenses may take some time to prepare, and in some cases further clarification may be required from the Canada Revenue Agency (CRA). Condo owners who wish to claim eligible common expenses related to HRTC on their return may want to contact their condo board or property management office as early as possible to give administrators enough time to prepare and provide any appropriate documentation, where applicable.